PLEASE NOTE: THIS IS FREE SOFTWARE, THERE IS NO NEED TO PURCHASE. Luxriot Evo is a complimentary version of the new-generation Luxriot VMS software. Delivering an outstanding quality performance, this video management system supports over 4000 cameras from major producers and is ideal for use at homes or small offices with surveillance networks of nine cameras or fewer. Luxriot Evo supports 9 camera channels. If you need support for further camera channels, you would need to look towards Luxriot Evo S, which supports 24 / 48 / 96 channels. The meticulously designed interface will allow any user to quickly understand the whole process of configuration and start using the software. Luxriot Evo is a free product, and so it does not fall under Luxriot technical support services and has a much shorter list of components. Should you need a more comprehensive functional or enterprise-level video management system solutions with complete surveillance ecosystem, please refer to more advanced versions of the software – Luxriot Evo S.
Luxriot Mobile is a free application for Android and iOS devices. It allows you to access Luxriot VMS Servers' live and recorded video streams using your smartphone or a tablet from almost anywhere. VAST is designed to manage all of your IP cameras with H.265 video codec. You can monitor, record and playback hundreds of cameras with ease and efficiency. There are many diverse solutions available with VAST such as VCA Integration, Panoramic PTZ and Line Crossing Detection. This means that the software is suitable for a variety of applications such as industrial, retail and residential uses. Click here to download VAST for free. With this download you are able to use the software with 32 channels for free. If you need to purchase additional VAST licenses you can do so here. Support list - Max Channels: 128 Channels (with Dual Monitors) - Video Resolution: Up to 9MP Please note - ONLY Vivotek cameras can be used with the free 32 channels. If you wish to integrate cameras from another brand, this must be done by purchasing VAST licenses. iViewer is a mobile app from Vivotek that allows customers to monitor locations on the go directly from their mobile. The interface is easy to use and can manage hundreds of cameras at once. The cameras can be accessed by VAST, an NVR or by direct link via IP address. Click here to download iViewer for Android. Click here to download iViewer for iOS. Milestone XProtect Screen Recorder is an add-on product compatible with Milestone VMS products. Staff management and training: - view video data from employees' computers, including XProtect Smart Client activities, to ensure operations are running smoothly. Simultaneously play back video recordings on multiple computer screens to efficiently educate and train staff. Transaction monitoring: - screen recorder makes auditing staff activities easy. You can view captured screen recordings from POS systems and computers to verify transactions and maintain an account of fraudulent activities. Please note: Screen recorder takes up one of your camera/device licenses. Screen recorder must be downloaded from here. 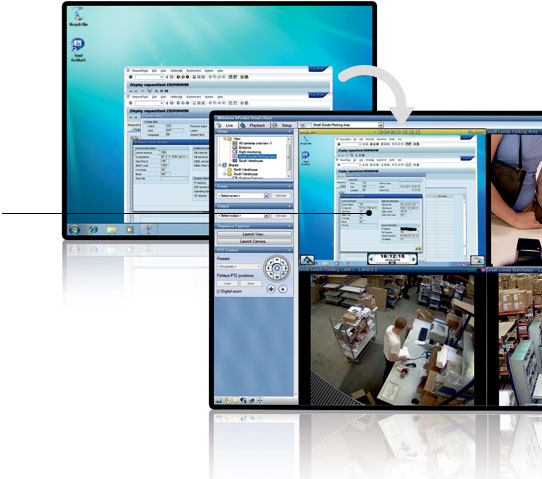 NB - ACTi's CCTV recording software will only manage and record ACTi IP CCTV cameras. Inclined ceiling mount for Hikvision Fisheye Cameras. Junction Box for Hikvision's Mini Pan Tilt Cameras. Milestone 1 Year Care Plus for XProtect Express+ Device License. Rackmount ears for the E and I Series NVRs. OPEN BOX ~ Only 1 Available!